In recognition of his exemplary contributions to laying the theoretical foundation for the description of transport processes through and along the dividing surface between two dissimilar media and the development and refinement of computational techniques for the analysis of data from complex systems. This has been applied in the analysis of laser data, extra cellular recordings from the medicinal leech, human electromyograms (EMG) and electroencephalograms (EEG) and vasomotion data from monkeys, among others. He has been involved in Philippine science as a United Nations Development Programme consultant at the National Institute of Physics, University of the Philippines Diliman, in 1986, then in 1996 at the Centre for Fluid Dynamics, UP Los Baños and at UP Baguio. 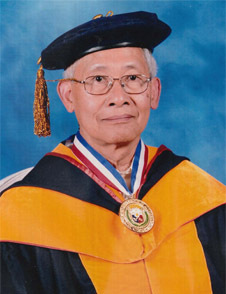 As a Department of Science and Technology Balik Scientist in 2008 and 2009, he conducted workshops at the Mindanao State University -Iligan Institute of Technology (MSU-IIT) and started mentoring graduate students and conducting collaborative research. In addition to the 58 students he had mentored and graduated in US universities, he has graduated 4 MS students at MSU-IIT and continues his service to the nation in developing much needed human resources in mathematics and physics. Development and refinement of algortihms for the calculation of quantitaive measures of complex spatial and temporal behavior and for the identification and classification of complex systems.